We’d love your help. Let us know what’s wrong with this preview of Lucky Number Thirteen by Colyer Jameson. Veteran NYC cabbie Demyan Rutzneighov accepts his lot in life, but in the city that never sleeps, a "hard day's night" can LITERALLY be murder -- random drivers are turning up dead. The killer has had NYPD chasing a ghost since 2004, and Rutzneighov fears he may be next when a close encounter with a mysterious and sinister passenger changes everything. When NYPD's murder i Veteran NYC cabbie Demyan Rutzneighov accepts his lot in life, but in the city that never sleeps, a "hard day's night" can LITERALLY be murder -- random drivers are turning up dead. The killer has had NYPD chasing a ghost since 2004, and Rutzneighov fears he may be next when a close encounter with a mysterious and sinister passenger changes everything. To ask other readers questions about Lucky Number Thirteen, please sign up. 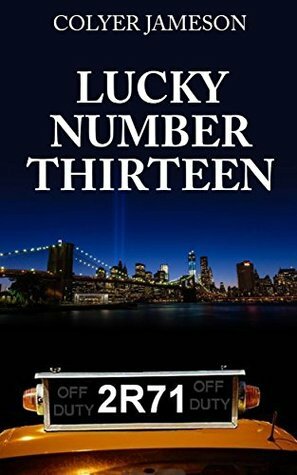 I’ve read quite a few thrillers, and I have to say, I love the idea of the murder mystery presented in the pages of Lucky Number Thirteen. The author did an amazing job of bringing to life the New York City streets and the monsters lurking within them. Gripping from the very first murder of a taxi cab driver, this book takes you through twists and turns that will keep you guessing until the end! Not to mention the witty thoughts and dialogue of the characters. One of my favorite scenes in the book describes a car accident the main character oversees in which the truck responsible has a bumper sticker that reads “I don’t Dodge, I Ram,” to which the character remarks on the irony. Pretty funny to me which only added to the good list of things I have to say about this book!